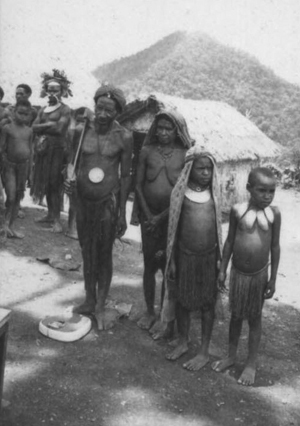 We had also not yet experienced a visit from the Kiap – the Patrol Officer in Simbai. One of the Kiap’s official duties was to keep the census records up to date. The Kiap who was on duty when we were there rode his motorcycle to visit clans near Simbai. He had, however, not yet managed to get the Kiap Road in the lower Simbai Valley cleared and widened sufficiently so that his motorcycle could get through. 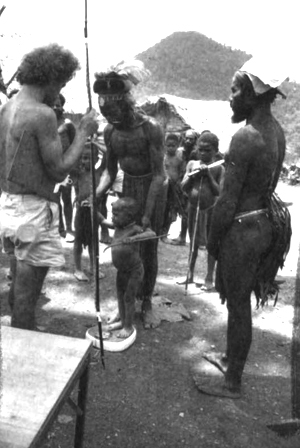 Therefore, to come to the Fungai area - a 3 to 4 days’ walk from Simbai, he, or other officials such as Australian agricultural officers or medical officers, had to organize major expeditions, ‘patrols’ consisting of police constables, a clerk, and a number of carriers. The whole group would stop each night in a different haus kiap. 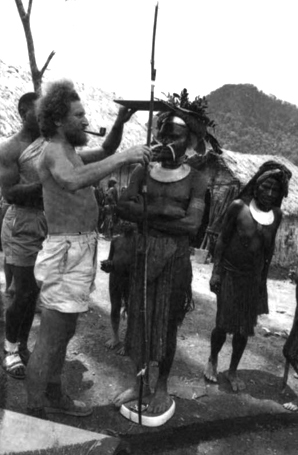 There was great excitement when a patrol would arrive at Tababe, the Haus Kiap that was about an hour’s walk north from Gunts and was officially designated by the Australian Administration as the gathering place for all the people of the Fungai, Korama, Bomagai, and Angoian clans. Everyone was in full bilas for the occasion. 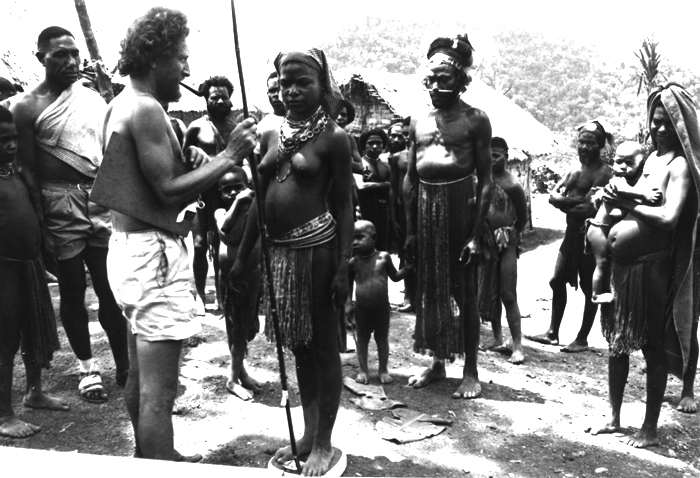 The Bomagais and Angoians were the first to be called. I easily recognized the men who had helped build our house and had frequently visited Gunts. 159-25: Bosboi Giribo and his family line up in front of the Patrol Officer. It was a lovely day with clouds scudding through the sky. For a moment, Fogaikump mountain stood out darkly behind the bright rooftops of the Haus Kiap and the haus kuk. In the background, Kabi and others waiting their turn stood around, smiling. Then it was the turn of the people of the Korama clan. 160-16: Tultul Banka and his family. 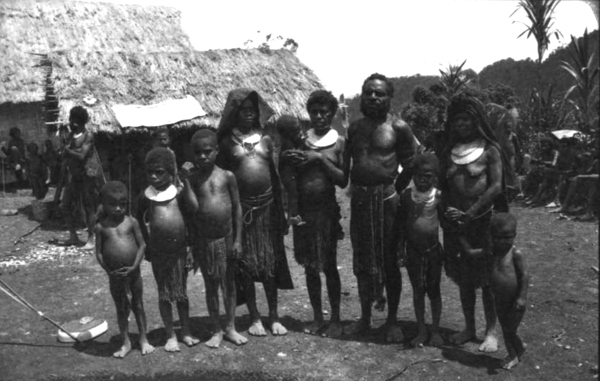 160-18: Aikapo’s father, mother and sisters. Bossboy Gul in full bilas stands in the background. to the numbers on the tape measure. over its shoulder is held gently on the scale by its father. 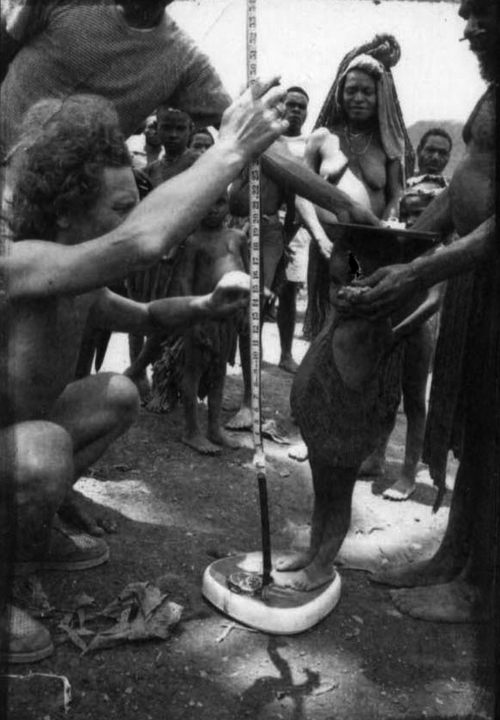 The first of the Fungai clan families to be measured was Bossboy Gul’s. He was highly bilased and stood with his arms crossed firmly on his chest. He was even wearing an angane shell around his neck. 160-23: Marek measures Bosboi Gul, as his wife, Ke, looks on. Luluai Pfun and his immediate family were next. His older brother, Awar waited patiently in line. Though he was a very influential person among the Maring themselves, he was never one for show and had never been acknowleged by the Australian Administrtion. Even upon this occasion he only wore a few dried branches of leaves sticking into his belt and, instead of feathers, had affixed a piece of paper to his mamb kun. 160-29* Pfun steadies Arum on the scale, gently holding her two arms. 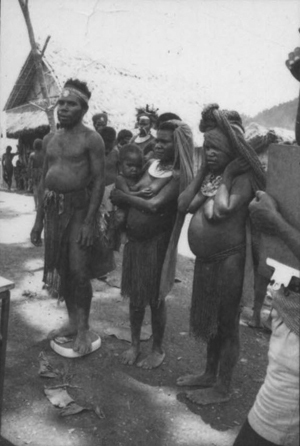 on the right her mother, Komba, holding her little brother, Mbuk. Completed in August, 2011 from details in Chapter 82 of the Yellow Book.